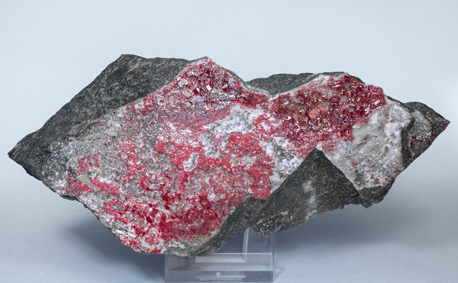 Polycrystalline aggregates with rhombohedral forms and on a matrix of massive Cinnabar that has very bright cleavage surfaces. 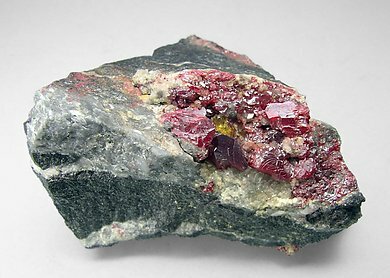 We note the presence of Cinnabar crystals, even not being so well defined due to that they are very uncommon at this mine. We’ll send to the buyer the original label and also a copy of the computer card with the full text of the collection catalog. 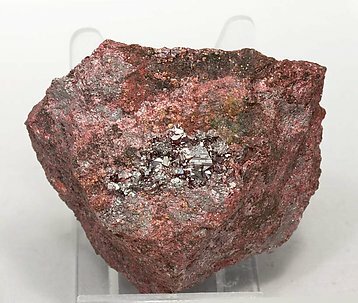 An excellent sample from one of the most classic localities for the species but rarely appeared there in significant sharp crystals. The small crystals of this piece are morphologically complex, with the dominant faces of the rhombohedron. A lot of them are individual and transparent, very bright and on matrix. An European classic. Small group of small but very well defined and bright crystals. 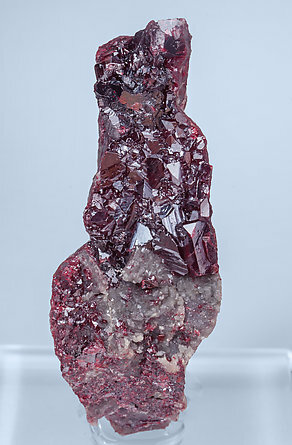 The specimen is from the El Entredicho mine, in Almadenejos which is some distance from Almadén and whose crystallizations are very infrequent. 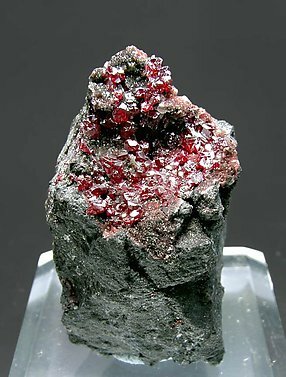 Well defined and bright Cinnabar crystals, some of them very aerial, with prominent rhombohedral faces with curvatures and fine striations. We can see small drops of liquid mercury on the matrix. Parallel growth of rhombohedral crystals. 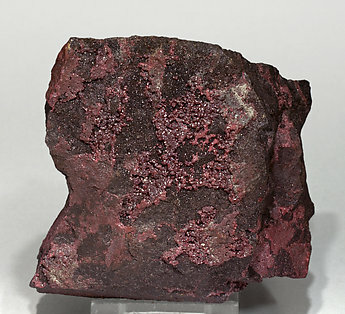 They have a considerable size for the locality and present good color and luster, even considering the long time passed since the specimen was mined. The crystals are small but the color and brilliance are exceptional. Folch found it at the Almadén Mine in 1923. 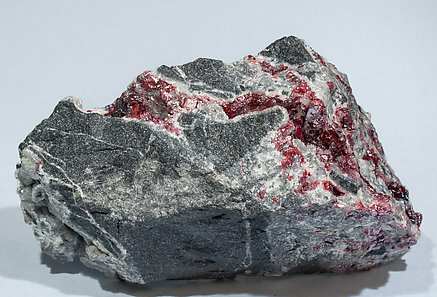 Aggregate of Cinnabar crystals with a dominant rhombohedron, typically striated on specimens from this locality. Color is very rich and deep and the luster is excellent. 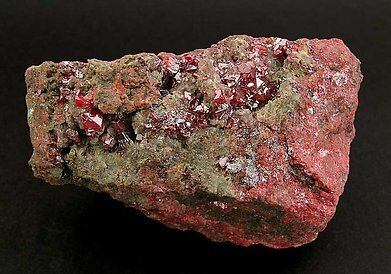 It is in a fine-grained Cinnabar matrix with interstitial native Mercury. A splendid miniature with perfect growth of the crystals, in which the faces of the rhombohedron dominate. The color and brilliance are excellent. Folch found it at the Almadén Mine in 1923. Subtle sample. 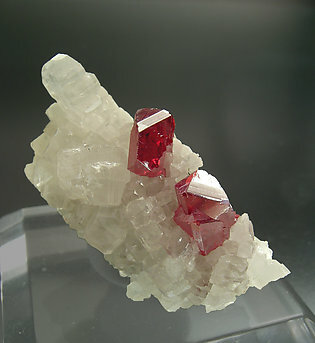 On a matrix of Calcite crystals perch two perfect crystals of Cinnabar. They have sharp faces and edges, transparent and bright, and the color is incredible. A little jewel. Sharp prismatic crystal of hexagonal shape and parallel growths. It has bright and very well defined faces and edges and strongly contrasts with the Dolomite matrix. As usual with this kind of Chinese samples, the matrix is more or less sawn, but in this case it doesn’t affect the esthetics of the specimen. 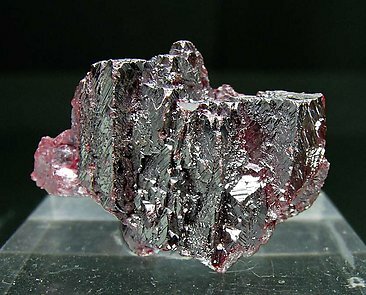 Crystal of Cinnabar of thick tabular habit and hexagonal shape. 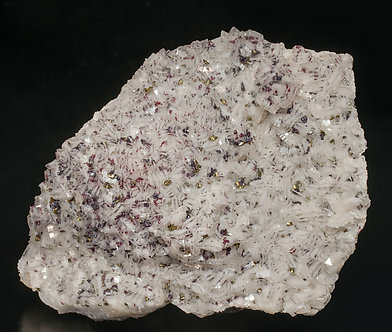 Both the faces and the edges are very sharp and bright and the crystals strongly contrast with the matrix of yellowish Dolomite. As usually happens with Chinese Cinnabars, the matrix has been sawn on the back, but not affecting, in this case, the esthetics of the specimen. The crystals, formed of a sharp rhombohedron and terminated by small triangular faces of the pinacoid, have extraordinary definition, transparency and size. It is nicely positioned on a matrix of Dolomite. A great one. We should warn you that the back of the specimen has been cut with a saw to protect the Cinnabar crystals. Group of Cinnabar crystals with well defined faces and edges, with a honey-colored Baryte crystal (that we have analyzed) on a black quartzite matrix and grey Quartz. Cinnabar is quite unusual from the Maramures area. It has only been found very occasionally, and even then it is found in botryoidal groups of micro crystals, not well-defined crystals. The intensity of the color, rarity and the fact that it is associated with Baryte make this old timer very interesting. 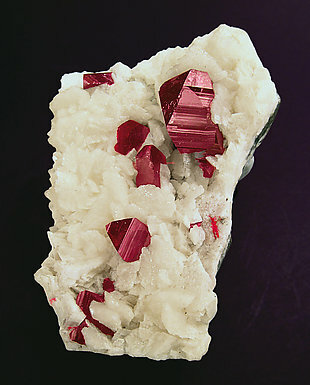 Sharp rhombohedral Cinnabar crystals on matrix. 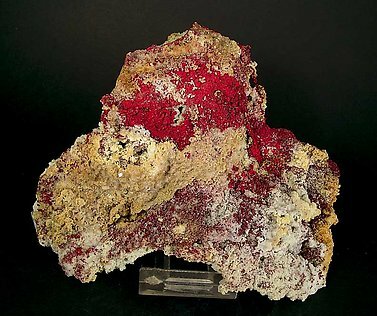 They have an intense red color and have hoppered growths with very small Quartz crystals. 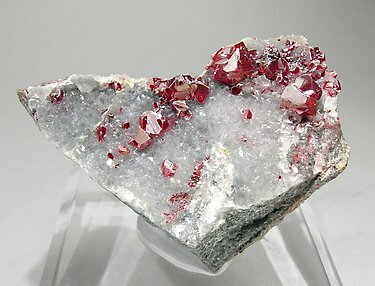 Crystal aggregates with very well shaped faces and edges, with a predominant rhombohedron and that are translucent, very bright, have a very vivid and intense red color, and are on a quartzite matrix with small Calcite crystals. 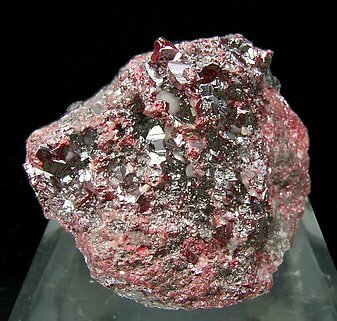 Rhombohedral Cinnabar crystals on matrix. 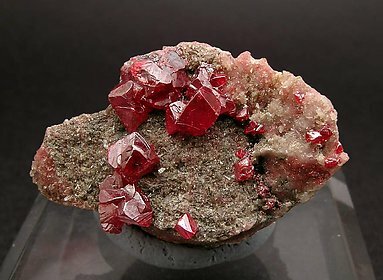 They have an intense red color and their faces and edges are very well defined, , with some hoppered faces that have small Quartz crystals inside of them. 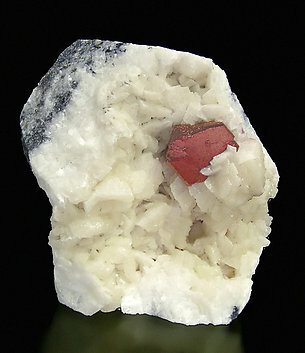 Thick tabular and very sharp Cinnabar crystals with very well defined faces and edges, bright and on matrix, with Calcite crystals. The sample is from the Vallecillo collection (Madrid). 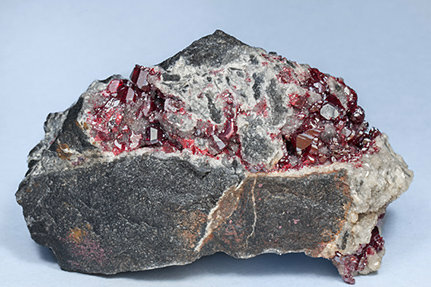 Aggregates of Cinnabar crystals with very well defined faces and edges, with a predominant rhombohedron, translucent, very bright and on a quartzite matrix coated by white Calcite microcrystals. An excellent Spanish classic. 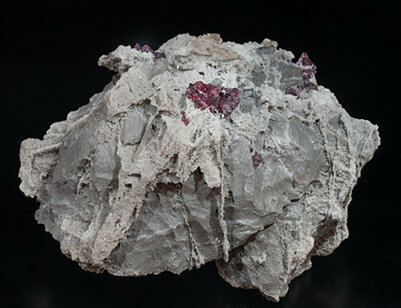 Crystalline growth, on a rock matrix with exfoliated Calcite, a very typical aspect of the old Cinnabar samples found at the place erroneously called “puerto de Tarna,” which really corresponds to the Las Señales mines, also in León province. 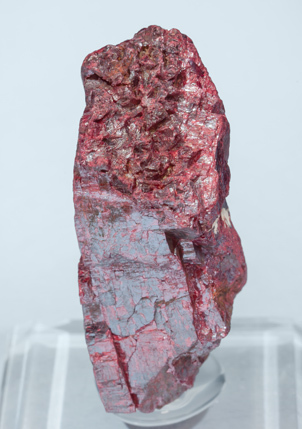 We note that this Cinnabar has not been acid-treated and that, in spite of the long time passed, maintains its intense luster and vivid red color. A classic, classic, from Spain. 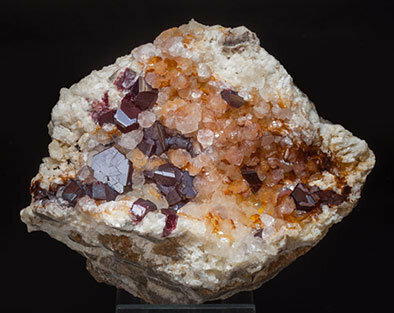 Groups of small crystals of excellent color and luster that contrast with a matrix rich in Quartz. 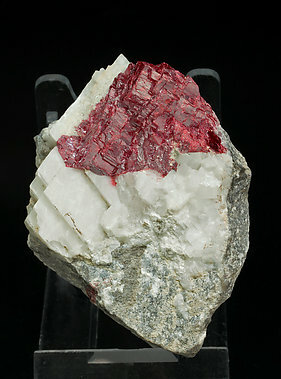 Very well defined crystals of excellent luster and magnificent red color, that contrasts on a surface of white Calcite, on rocky matrix. The specimen is more aerial and esthetic than usual in the samples from this classic mine, closed some years ago. Crystals that have very well defined faces and edges and are translucent, very bright and have an extraordinary color, very vivid. They are on a matrix of black quartzite rock “roca frailesca” (rock of the friars), which is typical from there, with Dolomite and Calcite crystals. Of great quality for the locality due the special brightness of the crystals. Group of Cinnabar crystals whose definition on their faces and edges is very much better than usual. They are translucent, extraordinarily bright and have a very intense and vivid color. 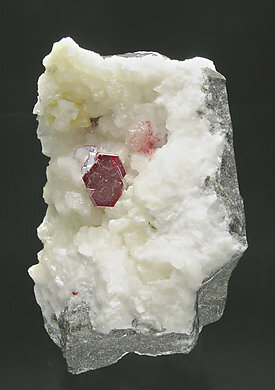 On matrix, with Calcite and native Mercury drops and inclusions. 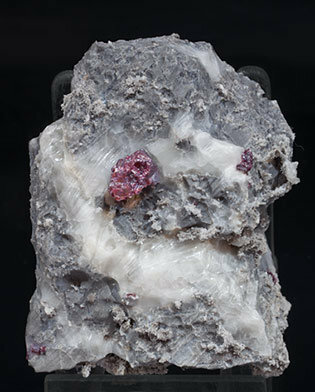 Druse of translucent white rhombohedral Dolomite crystals with included small Cinnabar crystals with a very vivid color and bright small twinned Chalcopyrite crystals. 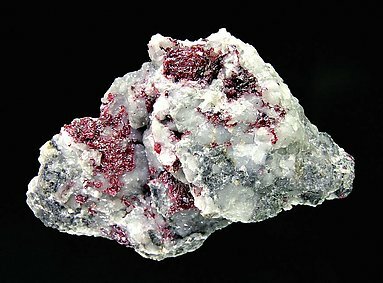 We note that the samples from Almadén with well crystallized accessory species are very rare, and even moreso if included and very visible in clear Dolomite.